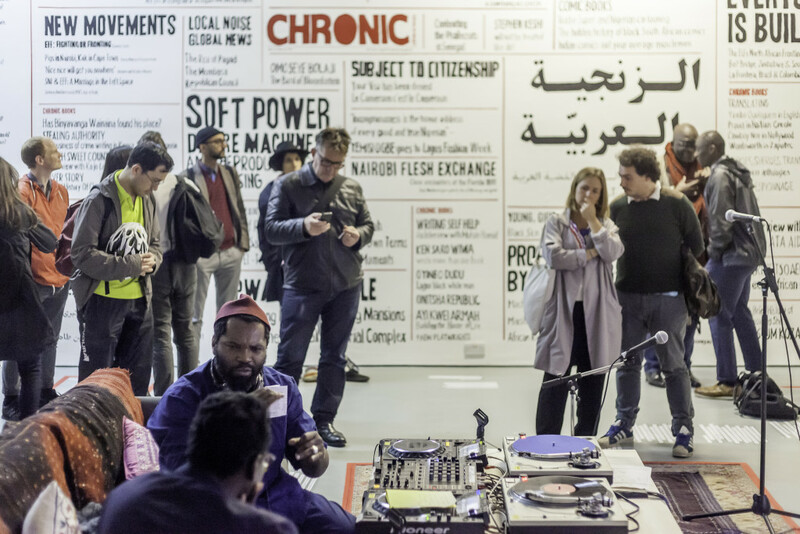 In the first week of October 2015, PASS presented a live broadcasting programme of music, interviews and events with Chimurenga collaborators in London including musicians, journalists, writers, curators and filmmakers. Participants included Chimurenga (Ntone Edjabe, Graeme Arendse and Ben Verghese), The Otolith Collective (Kodwo Eshun and Anjalika Sagar), Sorryyoufeeluncomfortable (Mahamed Abdullahi, Nadeem Din-Gabisi, Deborah Findlater, Laurél Hadleigh, Jacob V Joyce, Rabz Lansiquot, Nyasha Mangera-Lakew, Anni Movsisyan, Yusuf Musse, Salina Popova and Imani Robinson) and Pass Me the Microphone (Amanprit Sandhu and Hansi Momodu-Gordon), accompanied by guest presenters and interviewees. Category: Articles, Pass Pop-up | Tags: PASS London, PASS Pop-up | Bookmark: permalink.